All needles are labeled with a size number which reflects the overall size of both the needle and its eye. Traditionally, the lower the number, the larger the needle. However, the numbers used to denote the size vary depending upon the style the of needle. Here are common hand needle varieties and the sizes they come in. 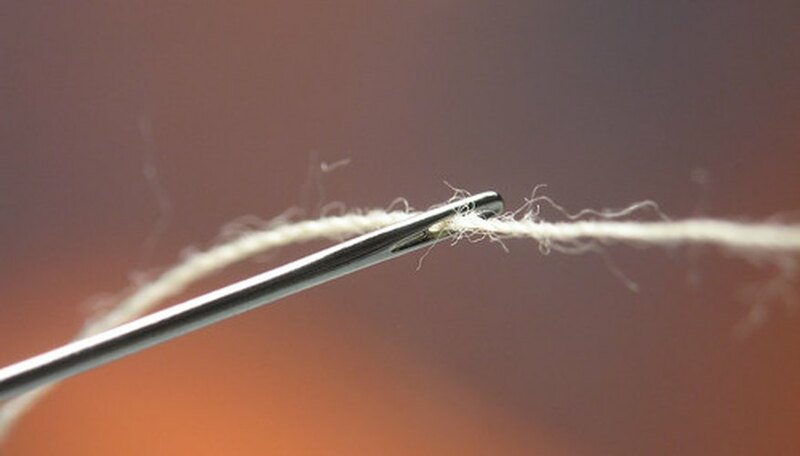 Common sewing needles are also known as sharps and range from size 1 at the thickest to size 10 at the thinnest. An exception to this rule are carpet sharps used for carpets and rugs which are sized at 16 to 18 and are larger than normal. Occasionally marketed as crewel needles, these have larger eyes than normal sewing needles so they can be threaded with multiple strands of embroidery floss but are otherwise similar. Thus, they share the same numbering system and are sized from a large size 1 to a small size 10 as well. Also called between needles, they are shorter and thicker than sewing needles and are designed to pierce thick fabrics. They also start at size 1 at their largest and continue to size 12 at the smallest. Designed for cross-stitch and other types of embroidery on even-weave fabric, their blunt tip allows them to slip through the gaps in the weave without tearing at the fibers. They start at size 13 at their thickest and continue to 28 at their thinnest. Related to tapestry needles, they have large eyes and sharp tips and are often used in ribbon embroidery. Beginning at size 13, they decrease in size to a 26. Stephanie Fidalgo is a freelance writer with a Bachelor's Degree in History from Clayton College and State University who has been living in the Atlanta area for years. She has always enjoyed writing and researching academically and now uses these skills to write about her passions at Demand Studios and eHow.